Rejoice! What? With so much that's wrong in the world? When so many people are facing apparently hopeless situations that never seem to get better? How can anyone in such circumstances rejoice? Why am I even thinking about rejoicing? There is a reason. Today, the 3rd Sunday of Advent, is sometimes called 'rejoicing Sunday' or 'Gaudete Sunday'. Some churches today indicate that it's a Sunday for joy by using rose coloured vestments or lighting a pink candle among the otherwise purple or blue Advent candles. At least one of the Bible readings used in church on this 3rd Sunday of Advent either gives a reason to rejoice or has a call to be joyful. And that is why this Sunday is marked for rejoicing. Well that's all very well. What if you don't feel joyful today? Are you supposed to pretend joy when you might have many good reasons to feel thoroughly miserable? I don't think so - pretending joy would be to add guilt to the misery and also misunderstand the nature of Advent rejoicing on this day. The whole of the 4 weeks of Advent is about looking forward in hope. In spite of whatever feelings we may have today or the circumstances we are in, the message of Advent is that God comes to save, the coming of the Saviour is near. Things will not always be as they are now. There is joy to come, even when we can't feel it now. 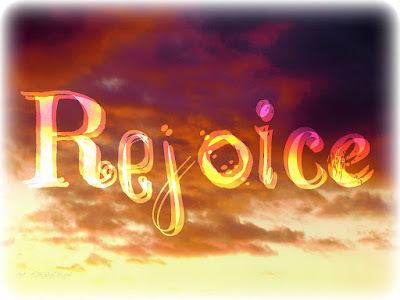 The rejoicing we are encouraged to share in today is rejoicing in hope, rejoicing in Christ our Saviour. The Christian hope is based on trust in Christ, God with us in the reality of this world with all that is wrong with it, a light in the darkness, a blossoming in the desert. I've just come across this short video which is based on the Bible readings for this Sunday (Advent 3 Year A). I think it is lovely. It reminds me of reasons to hope in the darkness or the desert. So even if your attempts to rejoice today are made through gritted teeth, take a look at this and hold these words and pictures in your heart for encouragement.